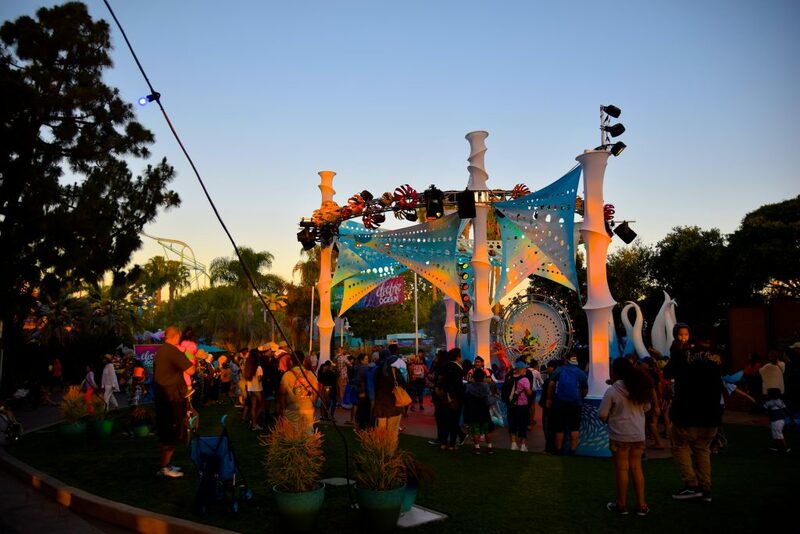 Sean: It is not often a summer nighttime event is overwhelmingly spectacular, and then there’s SeaWorld San Diego’s Electric Ocean. 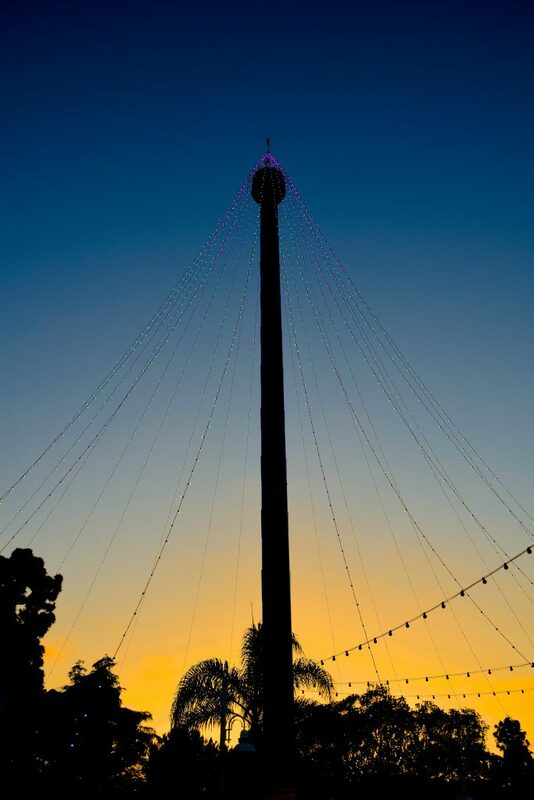 After dark the park turns into a light and sound filled wonderland with a ton of entertainment and scenery to admire. This year we finally got the chance to experience Electric Ocean. Join us to learn more about one of the nation’s best nighttime theme park events! Electric Ocean was an important factor with our timing of our SeaWorld San Diego visit. 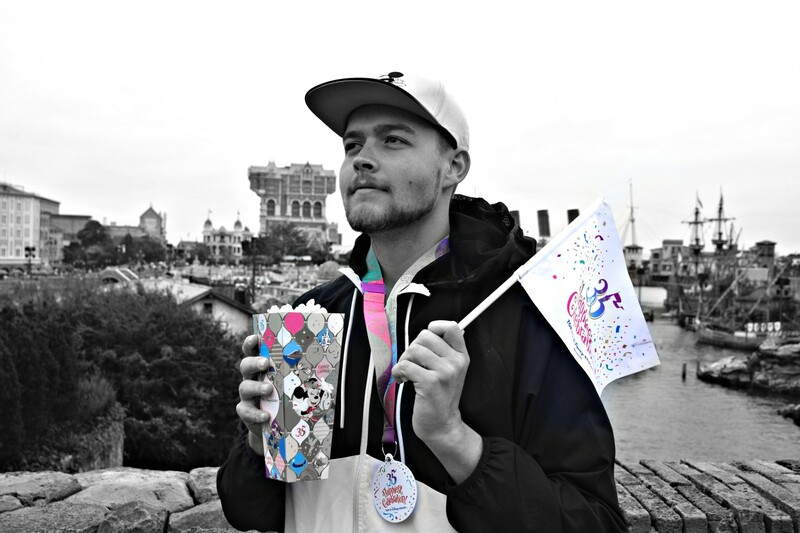 The new-for-2017 event was a hit with the crowds in both Orlando and San Diego and in 2018 it was rolled out to the park in San Antonio as well! 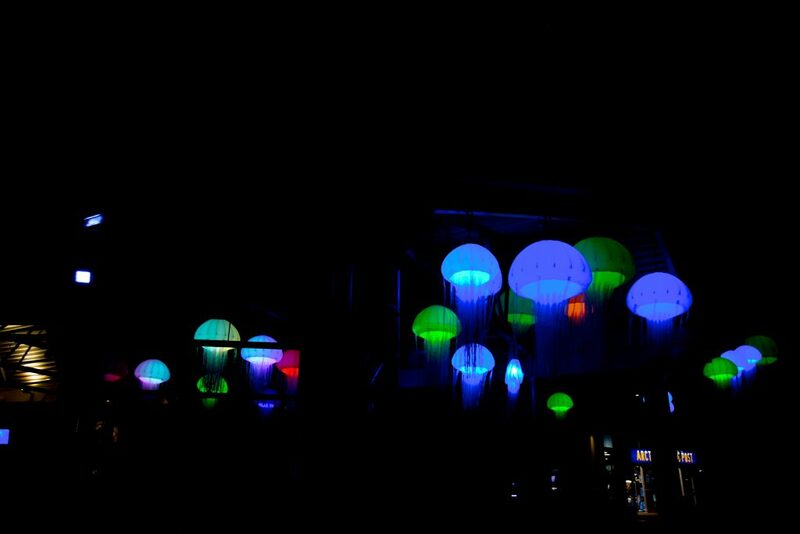 Electric Ocean brings along a plethora of additional shows, experiences, scenery, food, drinks and shops. 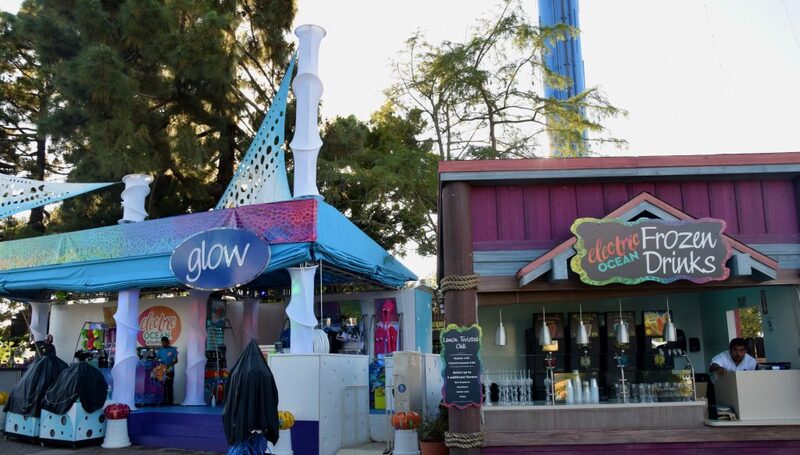 Here for example we see the Electric Ocean Frozen Drinks stand as well as the Glow store, which is where glow-in-the-dark merchandise is sold! 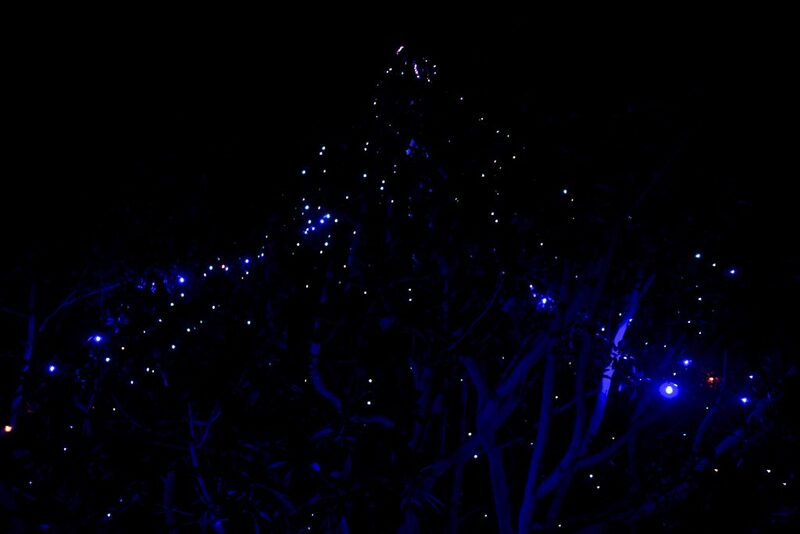 Something that is as beautiful by day as it is by night is the Electric Ocean Sea of Life, a big shiny collection of animals that glimmer in the sunlight and electrify in the dark. This set up can be found right behind the Nautilus Amphitheater near the Penguin Encounter and Wild Arctic attractions. 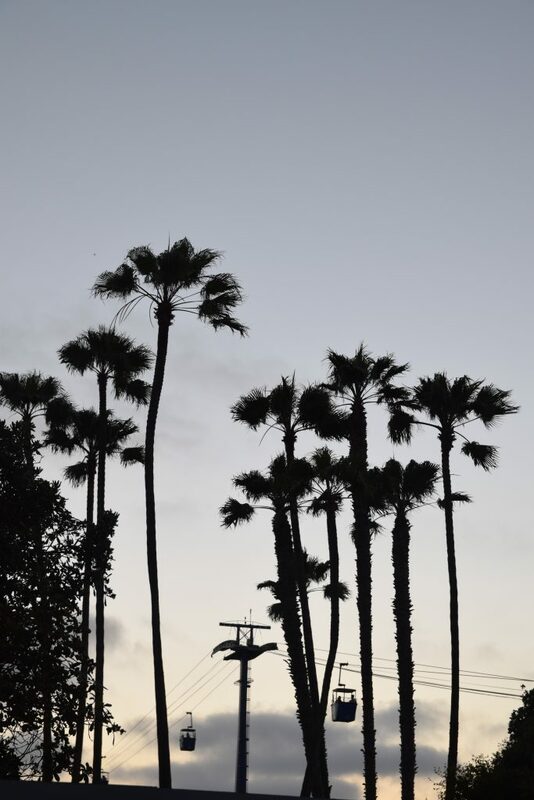 When the sun starts to set the activities around the park start. There are 9 Electric Ocean shows and exhibits around the park, as well as “Glow Zones” and special ride experiences. 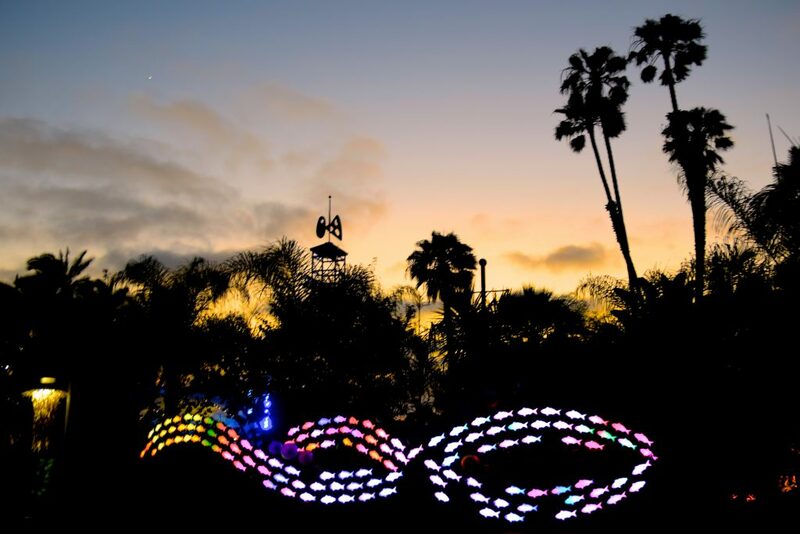 The Bayside Sky Ride is lit up with blacklights and runs along the bay offering spectacular night time views of the park as well as the surrounding Mission Bay. 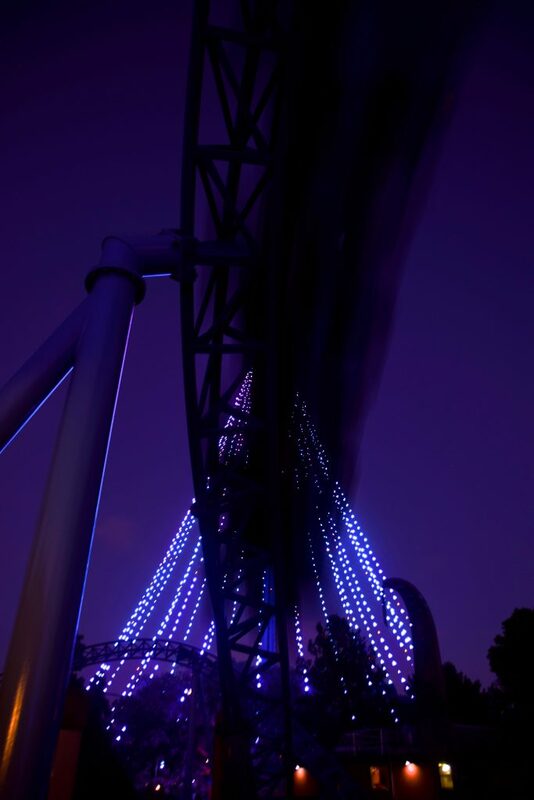 Manta turns into “Manta Re/Charged” after 7PM, which features a light show as part of the ride experience, and zooms by several lit up buildings and structures. 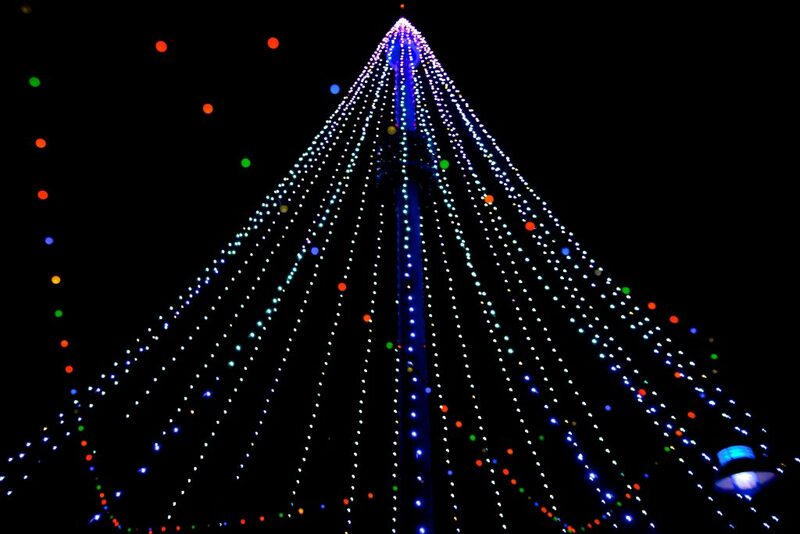 Of course the iconic tree of light on the Sky Tower is part of Electric Ocean as well! Also part of Electric Ocean is Club Current, a family friendly dance party with DJ, theming, lights and dancers! Surprisingly this was very popular, and it is certainly a good start to Electric Ocean! Between the Bayside stadium (Cirque Electrique) and the Bayside Sky Ride we find the School of Glow. 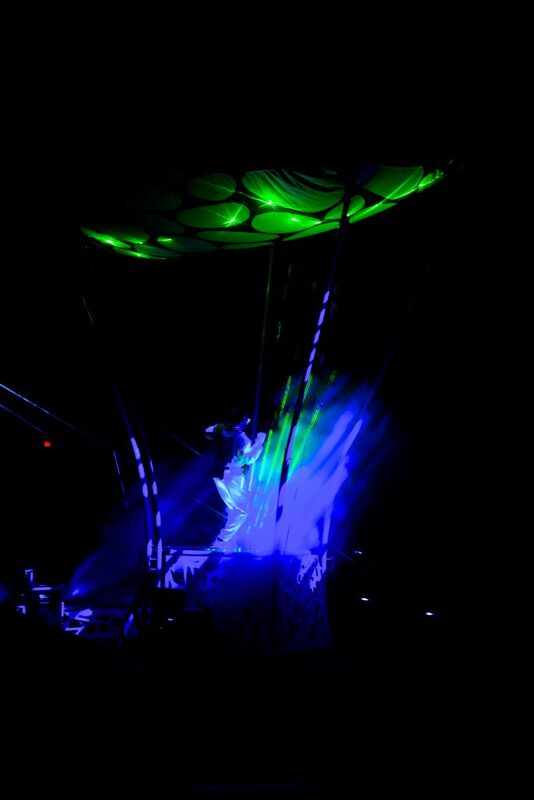 A forest of lights and effects as well as this interactive musically orchestrated statue with lights! Manta Re/Charged is a very fun experience that, though not particularly impressive, is just very fun and entertaining, definitely got a kick out of it and we rode several times. All around the park, even in areas that are not highlighted on the park map, there are lights in trees and visually stunning displays. I described it as a mid-summer Christmas. Great weather, amazing nighttime lights. 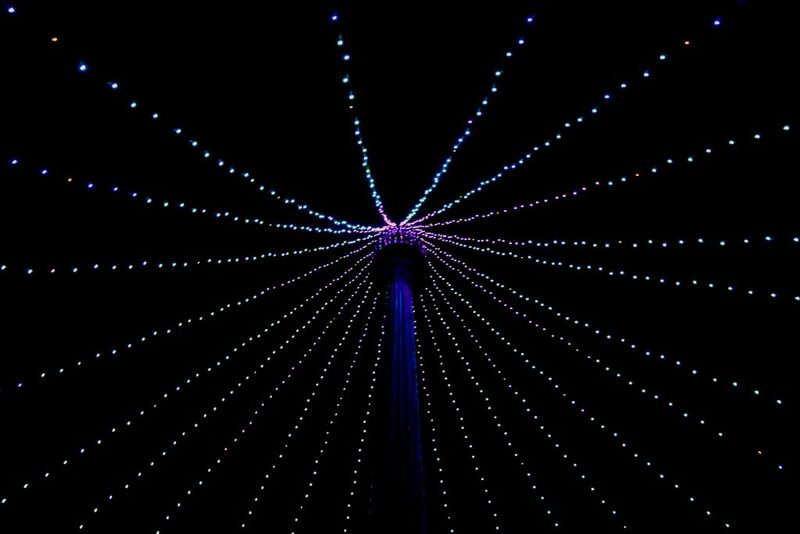 Here’s a closer look at the Sky Tower’s Electric Ocean light package. It’s stunning. I mean how do you not get holiday-time vibes from this? I do! But then there are all these ocean themed displays like the Sea of Life that remind you this is actually just a very well-rounded detailed nighttime experience. We didn’t get to catch Dolphin Days during our visit, but we saw Electric Dolphins at Electric Ocean, so that counts. Right near the Sea of Life, at the Wild Arctic ride and exhibit we have the Jellyfish Forest! An interactive jellyfish game is open for everyone in the center of the plaza with music playing setting a great mood. 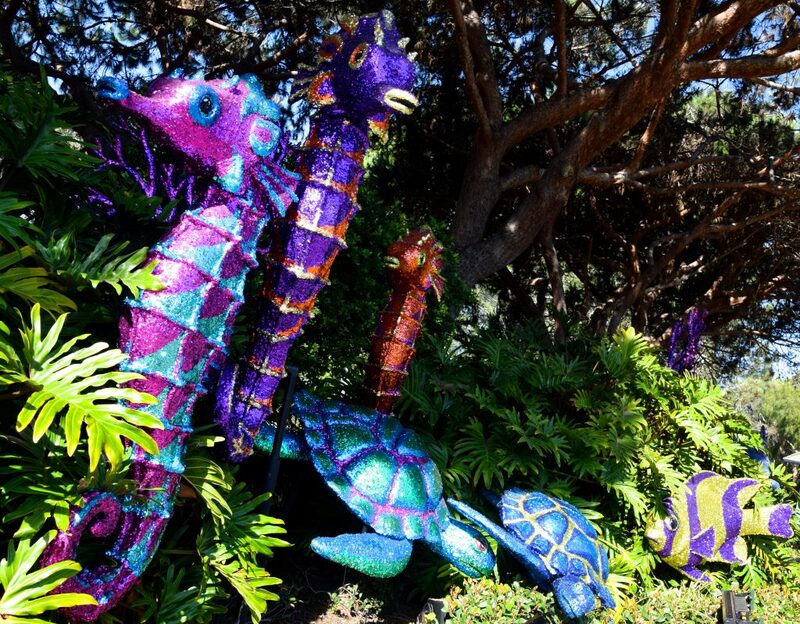 Or as SeaWorld San Diego’s campaign calls for, it was a good spot for the “#VibeTribe”. The actual Jellyfish Forrest was a little smaller than I anticipated, I had seen pictures of the Orlando version which was quite big and in an actual forest, as where ours really is just part of the Wild Arctic building. Nonetheless it was a fun sight to see, it’s all these small exhibits and displays that really transform the park into this one awesome place to be at night. 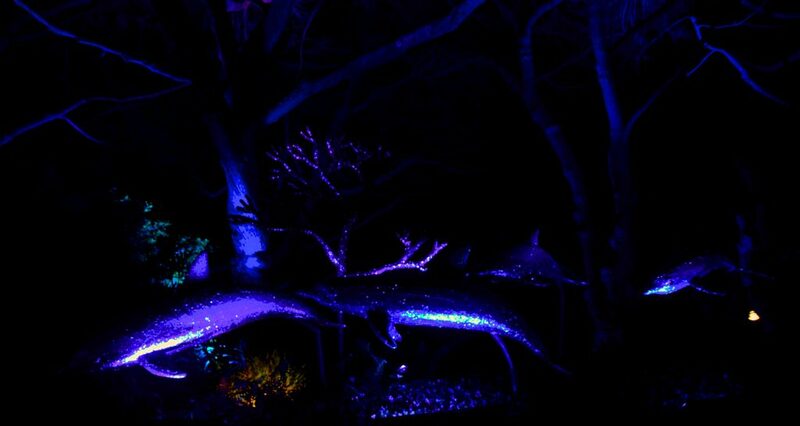 Right next to the Jellyfish Forest we find illumiNight, the park’s night time acrobatics and high-energy dancing show. 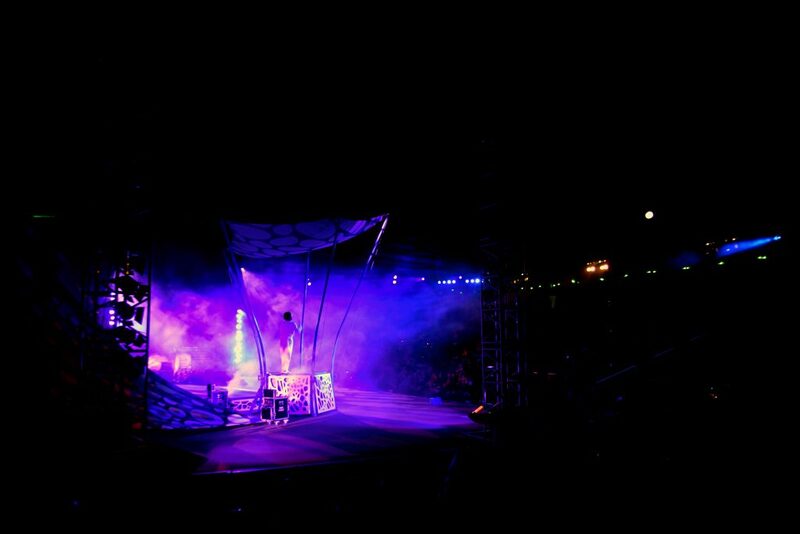 The show is one of the 2 main nighttime spectaculars at Electric Ocean that are held in stadiums, and this one can be found at the Nautilus Amphitheater. The show features lots of technology and a very interactive group of performers, it’s not entirely my thing but the audience was LOVING IT! Continue reading the report in Part 2 where we discuss the event’s best show: Cirque Electrique, as well as the spectacular Laser Reef and Atlantis Ignites! 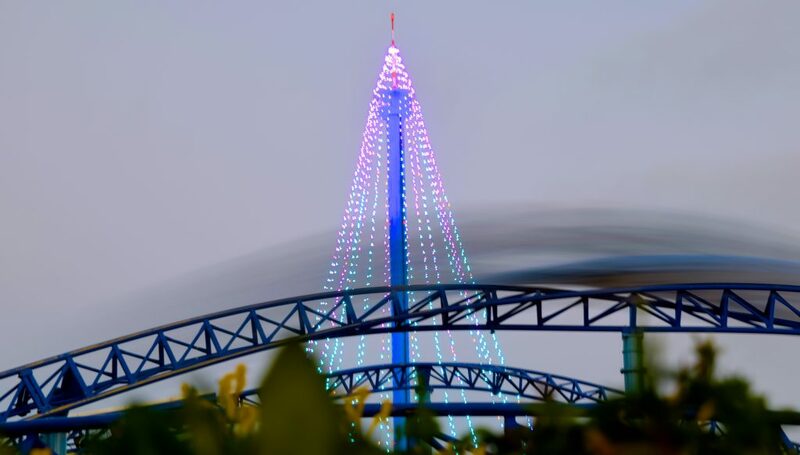 Previous PostPrevious Electric Eel – SeaWorld San Diego’s New Coaster!